140 casino games to play online right now! Did you know that if you chose to play a different casino game every day for a year, you’d get to play the same game just three times at Slots of Vegas? That’s because, with over 130 games to choose from, you could easily play online casino games for more than a third of the year without repeating the same game once. So, if you’re all about familiarity, we apologize. 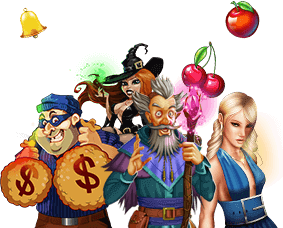 Slots of Vegas is all about offering the best and biggest variety of casino games. More slots. More table games. More video poker. But, don’t worry – you don’t have to keep changing games if you don’t want to. Find a casino game that you love and go ahead, stick with it! From slot machines and video poker to blackjack, craps, and roulette, you won’t find a more complete mix of casino games online than at Slots of Vegas. And we don’t rest on our laurels. We’re constantly adding new slot machines and exciting variations to classic games to the mix. You'll usually find a new slot games every month or two. It's all bundled together in a fun, realistic package that's complete with amazing graphics, big bonuses, and innovative themes that up to the ante on big-time excitement. We know you'll love Slots of Vegas, but we also know that you'll love it even more if you can play on someone else's dime. Our 250% bonus lets you play casino games with an extra 250% in bonus cash on whatever you deposit. Use coupon code NEW250 and it's yours. Ready to bust the dealer or hit the next big jackpot? Just click the Play Now button below and we'll start the software download automatically on your PC. Setup takes just a few minutes and requires only a few pieces of information. Once you've got your free account, you'll be able to get in on the casino games excitement 24/7.